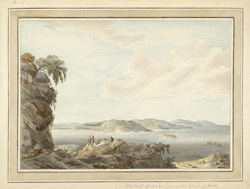 Whirlpool of Corivrechan near the island of Jura, drawn by James Miller in 1775, after a journey taken in 1772. The gulf or straits of Corryvreckan are a narrow passage of water between the north coast of Jura Island and south coast of Scarba Island in the Inner Hebrides. The name Corryvreckan comes from the Gaelic for ' Brecon's Cauldron'. It is named after a legend about a Viking Prince whose boat sank here in the notoriously dangerous whirlpool in the straits. Although it is possible for small boats to pass at low tide, many boats have been lost here. The novelist George Orwell almost drowned here when his boat capsized.